The Virginian Pilot, the local newspaper in Virginia Beach, VA, has a good graphic design department. 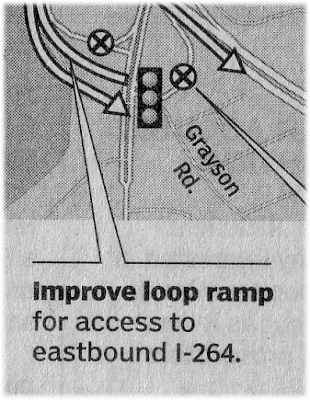 I have always liked their maps and this Sunday's edition had another fine example detailing the changes on Witchduck Rd. One element of their design program I really like is how points of interest are labeled using a modified balloon -- a simple pin shape with the label text below. All the points of interest clearly labeled and aligned at the edge of the map and the connections acute triangular shape does not interfere with the map's content. Does anyone have pointers to specific services or tools for cleaning up newspaper scans? It just seems that the page color can be subtracted without touching the printed image.